I always like June. It is like the intro to summer in terms of weather, produce, and weekends. Work is always busy (which I’m thankful for) but June has a nice buzz to it while still being a chance to breathe. We had a multi-occasion celebration in June for Father’s Day/Mr. J’s birthday/Momma R’s birthday and a few other fun plans. Mr. J got a new grill so there was A LOT of grilled dinners. He’d grill B, L & D if he could. 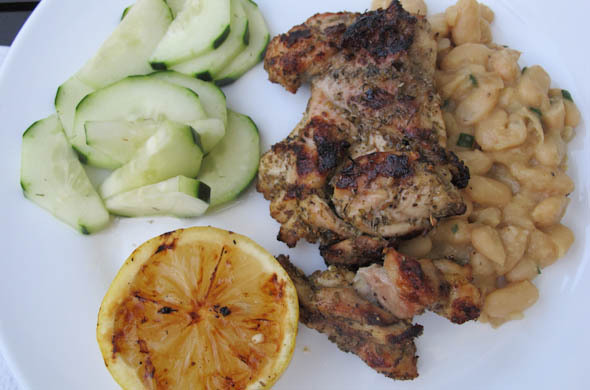 One of the first grilled meals was this Tuscan Herbed Chicken served over white beans with cucumber salad. I was ob-sessed. This needs to be a go-to meal. 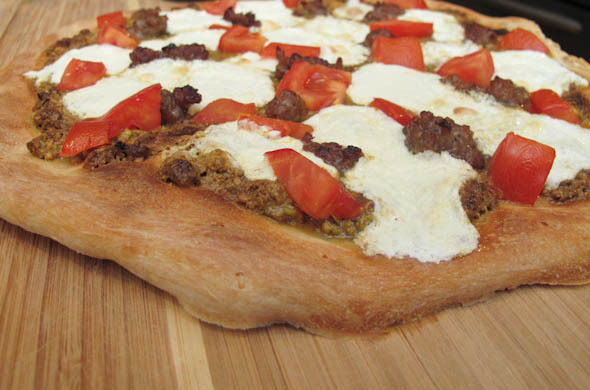 I don’t make nearly as many pizzas in the summer, to avoid heating up the house even more, though…I did make a Pistachio and Sausage pizza. I liked it and will mix things up by toasting up some nuts and adding them to my future pizzas too. This year’s birthday burger was a fun one! I dubbed them Picnic Burgers and topped them with colby jack cheese, coleslaw, and potato sticks. I made a great salad with Watermelon, feta, and arugula. I looooved this combo. I’m going to a bbq in a few weeks and I think I’ll bring this…I’m guessing nobody else will bring it. 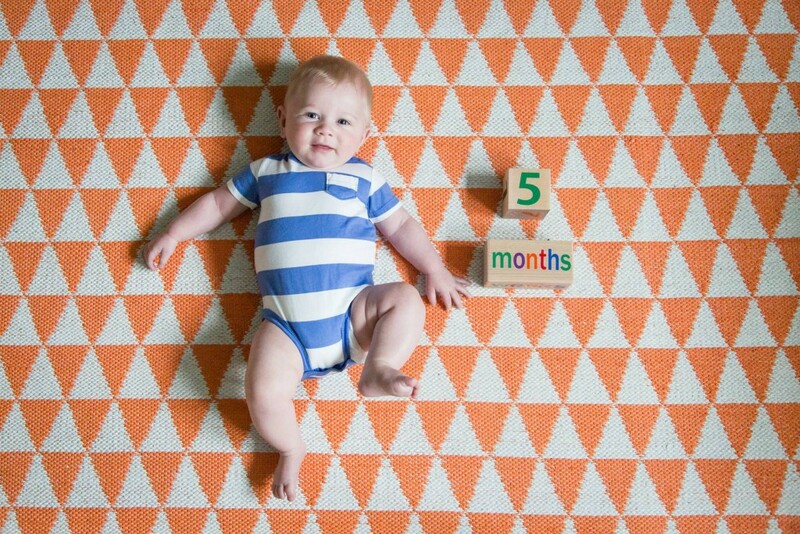 He’s already 5.5 months old! Crazy! He’s rolling non-stop, sleeping on his belly and side very often, and he is now able to scootch backwards while on his belly. He’s now onto cereal…though saying that is a loose interpretation. Not a whole lot of it makes it or stays in his mouth. We’ll keep at it. He’s really funny, full of smiles and giggles. I’m convinced he’s teething. Every toy is most fun when it is in his mouth. We’ll see if teeth poke their way though anytime soon. We’ve taken him to a party and to some restaurants. He’s doing so great and we’re having a blast. It is nice to look back and see how far we’ve come. I’m proud of the 3 of us. The Year of the Earring: I got a May-pair just in time! Phew, I know you were worried! June’s are coming! I liked another pair, but the shipping was more than twice the cost of the earrings. 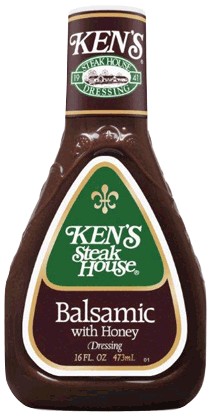 make more salad dressings: You’d better believe it. 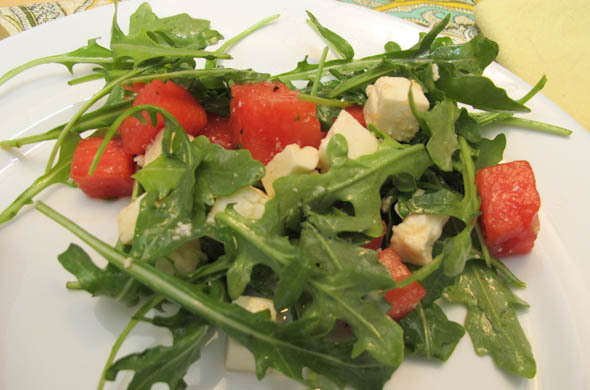 I made Parmesan Peppercorn dressing annnnd I made a Watermelon, feta & arugula with a citrus vinaigrette. 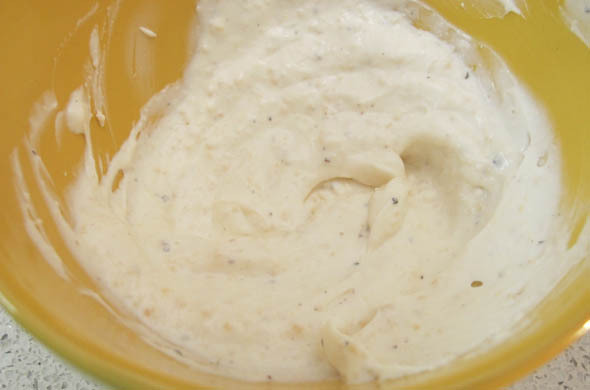 2 dressings. yes! 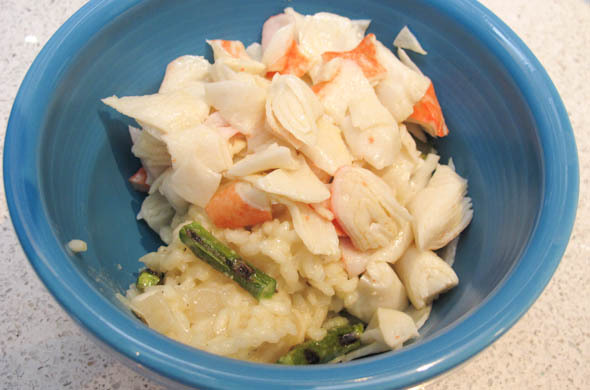 recreate restaurant menu items: I recreated a Davio’s lobster risotto with grilled asparagus dish that came out great! be more adventurous with my reading selections: I nixed the Paradox of Plenty. I read The Boston Girl by Anita Diamant and couldn’t put it down. I tried to get into How to Build a Girl and it wasn’t for me. Now I’m reading Garlic and Sapphires by Ruth Reichl and I’m obsessed. I’m sure I’ll be done soon. use the crockpot more: Yes! It’ll hit in June, but it was fun for tacos! seafood once a month: I used some lobster in the risotto and then we grilled salmon with dijon butter sauce for the father’s day/birthdays celebration. It was great. Guys. I’m so jazzed about this salad. It was so good. I was just so excited and actually “cut the line” in the ole blog que. This 2 posts a week has been a good schedule for me and lately I’ve had enough posts ahead of time that I don’t have to be all that timely in getting the pics from my camera onto the blog with some words. This one skipped ahead of a few other goodies because I just loved it so. Chop the watermelon & feta into smaller-than-bite-sized cubes. 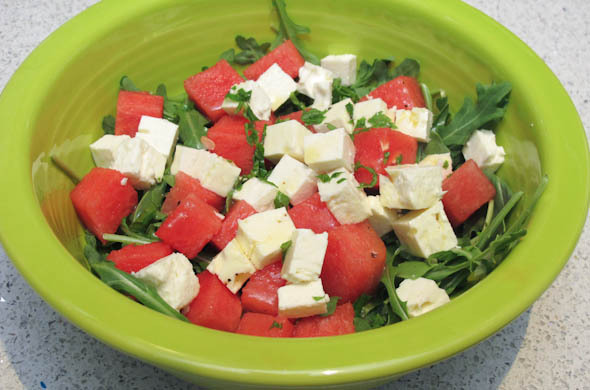 Lay the arugula into a bowl and top with the feta & watermelon. 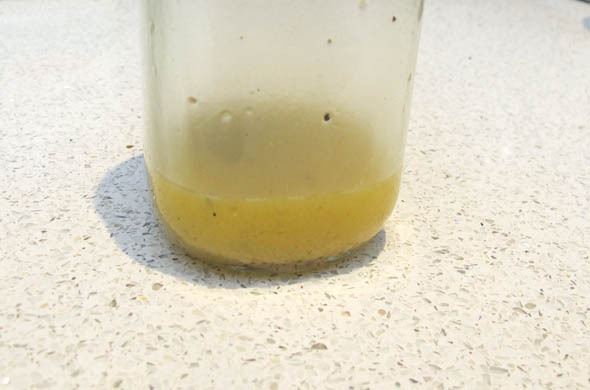 In a jar, shake together the juices, oil, vinegar, honey, mint, salt & pepper. Drizzle a little dressing onto the salad. Toss and then add more if needed. The watermelon adds some moisture so a little dressing might be enough. I seriously loved the pepper-y arugula with the sweet & cool watermelon with the crumbly salty feta. This salad is the perfect combination of sweet and salty and peppery. It also takes 10 minutes to shake up the dressing and cut the ingredients. Just 10 minutes to something interesting, different, and fresh. This was part of a crazy salad dinner we had. I wasn’t sure it was going to 100% be Mr. J’s kind of thing. I like the stronger flavored arugula than he does and watermelon isn’t is favorite. 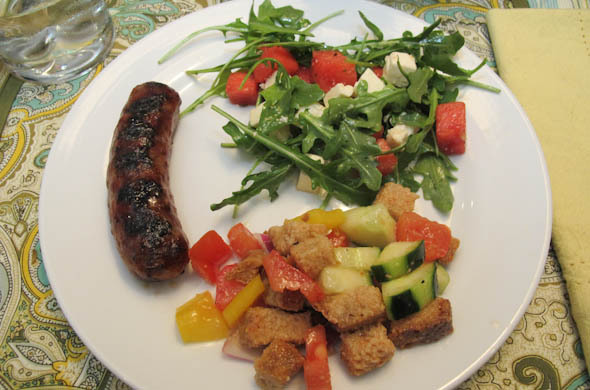 I made this one annnnd panzanella salad the same night with sausages on the grill. The two salads weren’t 100% complimentary but I’ll share that one soon. Maybe just don’t make ‘em both the same night. I began making Mr. J a special Birthday Burger back along the same time the blog started. I’ve made a lot of fun burgers so I have to be sure I save an idea or two when his bday rolls around mid June. This year’s picnic burger was very fun and all about the toppings. 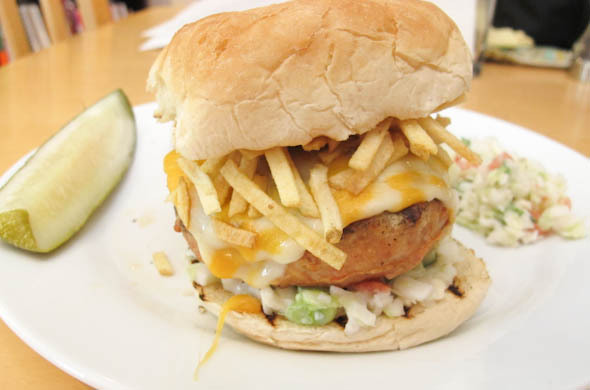 In 2015 it is a Picnic Burger with potato sticks and coleslaw. In 2014 it was a German Burger with horseradish, caramelized onions, pickles and a pretzel roll. In 2013 it was a Vermont Burger with maple mayo, cheddar, bacon, and spinach. In 2012 it was a Bacon Wrapped Burger enough said. In 2011 it was a Stuffed Burger stuffed with bacon & cheddar or bacon & blue cheese. I had no idea if it was going to be hard to find potato sticks, or if they’re not just a snack from the 1990s. Turns out, they were just in the snack aisle and I could buy just a single can. It is so funny to me that they come in a can. You pull the plastic ribbon around the top and pop the aluminum top off. Really, opening them is half the fun, but they had so much more potato flavor than chips do. They conveniently stuck to the cheese to stay on the burger while the cole slaw provided a crunch and a creaminess. Need other burger topping ideas? 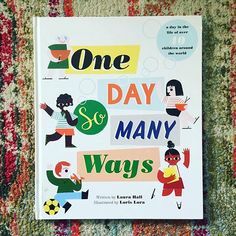 Find ‘em all here! 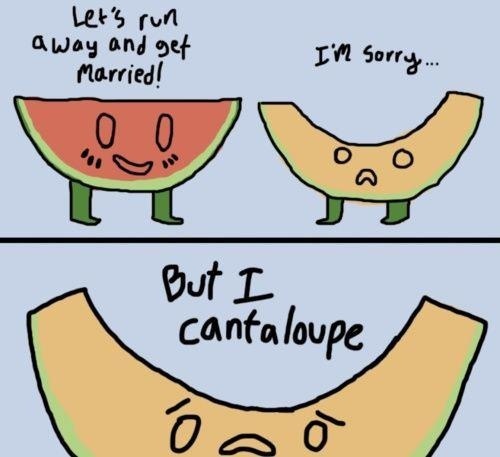 I don’t know why I haven’t ever used cantaloupe for a smoothie before. I tend to go for berries but switching up the fruits are important! 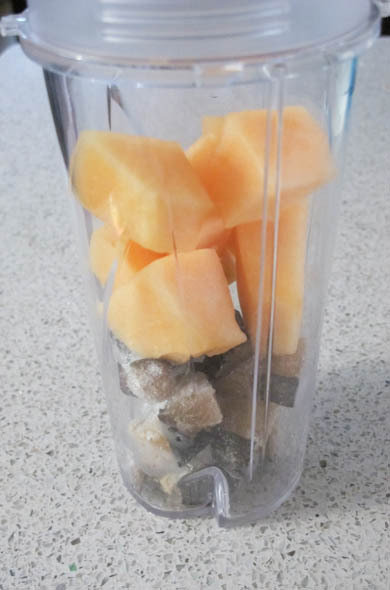 Mr. J isn’t that into fruit, but he likes cantaloupe so after he did all the hard work of cutting it up and storing it in the fridge, I helped myself to some in a smoothie. The flavor is so delicate, so I wanted to pair it with a fruit that wouldn’t overpower it. Also, I still have TONS of frozen pears in the freezer thanks to a generous host of a fall pear-picking-party who doesn’t even like pears. 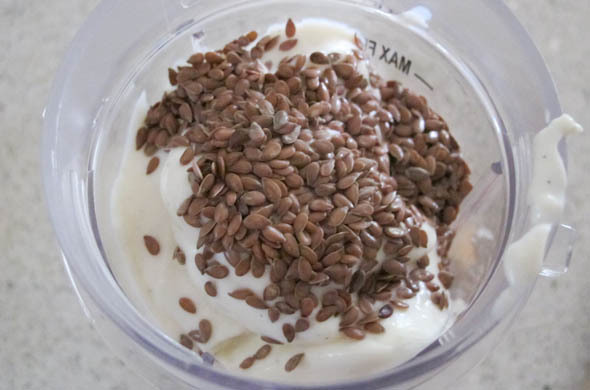 Add in the yogurt, a splash of milk, and flax seed. 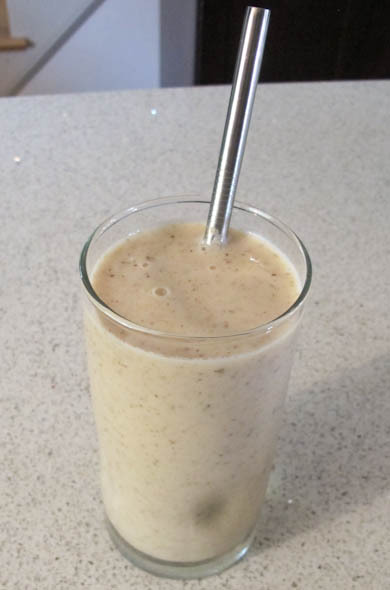 The flaxseed + light colored fruits makes for more of a murky-colored smoothie, but it was lovely and a great way to use a melon before it gets too squishy. Swapping the milk for some orange juice would wake this up a bit, though I liked the subtle flavors. The flaxseed doesn’t add any flavor or taste. It is just a good source of fiber, possible source to lower cholesterol and helps heart health in general. 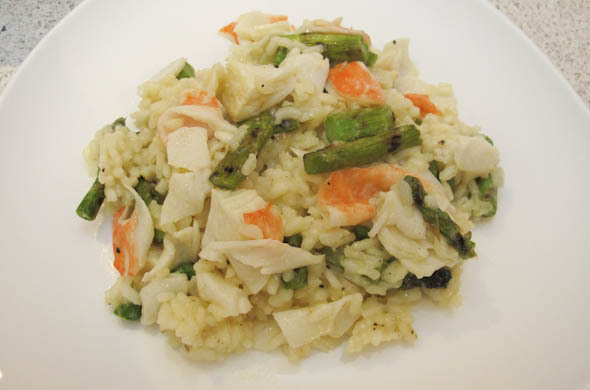 For my restaurant recreation this month, I was inspired by a lobster & asparagus risotto dish at Davio’s but I wanted to make it at home. 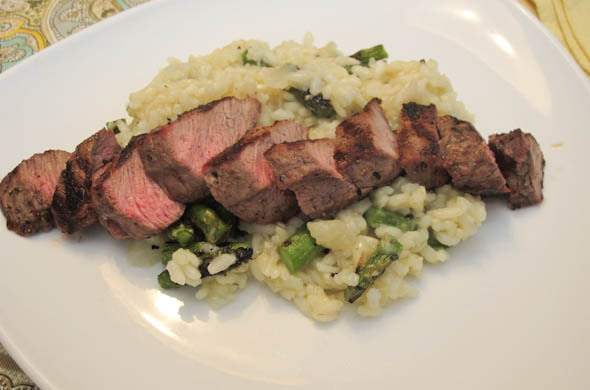 It also served as a reminder that risotto doesn’t only have to be winter food. 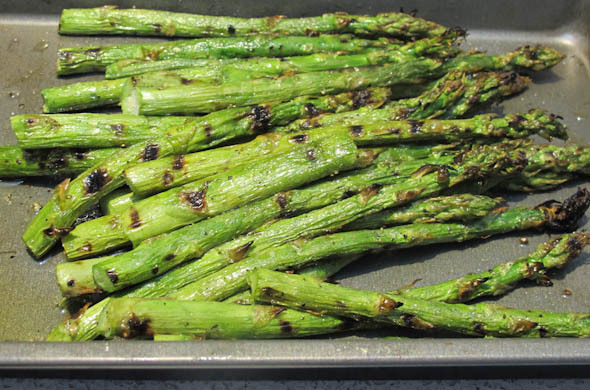 With Mr. J’s new grill, this still allowed him to fill his grilling quota with the asparagus. Seriously, he wants to grill bfast/lunch/din. I made this as a his/hers dinner that he had with steak and I had with lobster. The lobster wasn’t real so it was perfect to use in a cooked dish. I think I’ll use the remainder into some lobster mac & cheese. In a large saucepan, saute the onion in some olive oil over medium heat until they are translucent, about 5 minutes. Add in the rice and stir regularly for a few minutes to toast it, then reduce heat to medium low. In a medium saucepan, heat the water, broth, wine, and mustard to low heat. 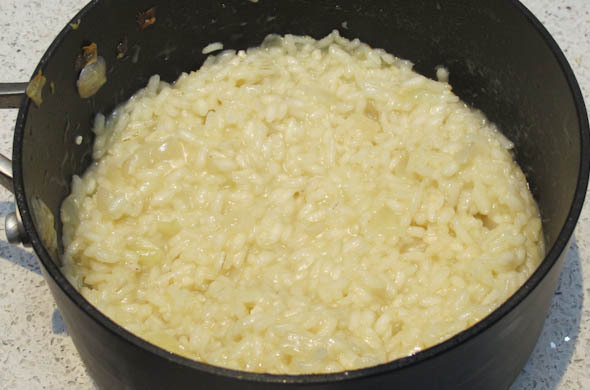 Add a ladle of liquid to the rice until absorbed. Continue adding, stirring, and simmering until absorbed. Then adding the next ladle-ful in. Cook the lobster in butter and/or grill the steak. 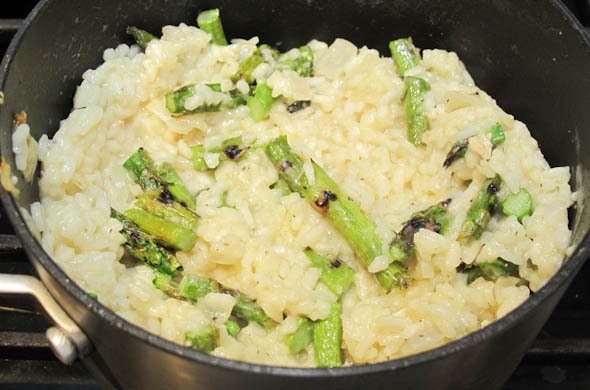 Gently fold in the asparagus and Parmesan into the risotto. Gently fold in the lobster meat. Mr. J’s was asparagus topped with some grilled steak. I liked the charred bits of the asparagus and I was careful to not overmix the asparagus. I didn’t want the pieces to be decimated or to lose all the grill marks into a blackened risotto! The risotto was creamy and perfect. I think cooking it over medium-low heat is the ticket. If it is at a higher temp it really gets sticky versus creamy. It takes just a bit of patience, and about 25 min of cook time, but if somebody wants to keep an eye on it while the asparagus is grilling, it works out just fine. Or grill the asparagus first and let it hang out while cooking the risotto. I could substitute grilled shrimp, or even salmon flaked apart, or grilled sausage…endless possibilities without even turning on the oven! Random post of different bits that have come to mind. Not useful for your everyday. Enjoy nonetheless. Do you have foods you’ve tried to like? I just saw a salad dressing made with kalamata olives and feta. That has me written all over it, except…. I don’t like olives. I’ve tried. I’ve seriously tried to like them and just can’t. If I had to choose a cuisine to eat for the rest of time, I might pick Mediterranean. Bring on the feta, and the hummus, and falafel, and the salads, and all the cucumbers, and the herbed or grilled meats/fish. I just would have to skip the olives. I remember being in Greece in 2008 and thinking: if ever there was a time to like a really good selection of olives, it was then. Nope. A no-go. I like pickles and briney things like capers, but no olives for me. Blue cheese & goat cheese. I just can’t do it. Just not my thing. I really love blue cheese dressing, but blue cheese itself is something my throat doesn’t really want to swallow. I don’t see the hype with goat cheese. I can tolerate it breaded and baked/fried. It is pretty pricey so I doubt anyone wants me to tolerate it. Yogurt & oatmeal are weird ones I didn’t like forawhile and then after not having them for years (college + a few more years) I tried them again and felt like I missed so many years of enjoying them! That kind of came back when I was pregnant and not wanting creamy/squishy things. Now I eat yogurt or oatmeal for most of the week of breakfasts. I’m newly obsessed with these Pop Corners. I love them. 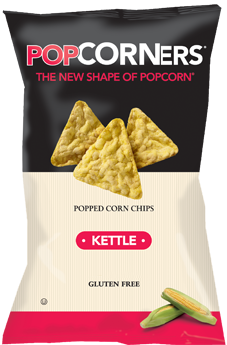 The kettle flavor is the best, but sea salt and white cheddar are good too. They’re kind of like popcorn, kind of like a rice cake, but better. I also am all about these itty bitty Greek yogurt cups. I can’t always find them, but when I do it is very exciting. 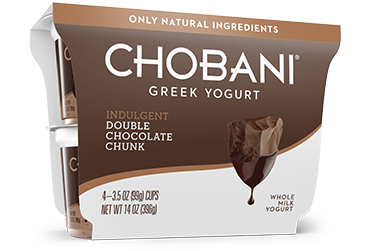 They are tiny cups with shaved chocolate chunks in the yogurt. I like the tang of the yogurt with the bitter chocolate. I inherited 3 after sis wasn’t impressed. Now I get them whenever I see them. I keep this dressing in my work fridge and I’m loving it. The dressings continue! This one is so versatile that I actually used it first as a condiment on a burger. Then later I put it on salad but it could go on anything. I only made a bit since that’s my favorite part of making my own dressings, that you can make a little or a lot. Then I’m not stuck trying to use up a whole bottle of something! Also, it is nice to know what’s in the dressing without a whole bunch of weird things to preserve it on the shelf for 10 years. In a bowl (or in a jar to shake) all the ingredients. Whisk (or shake in a jar) until well combined. Refrigerate for 30+ minutes. Serve & enjoy! I put some on a turkey burger. Such a great idea. It was a premade, turkey/chili/lime burger from Trader Joe’s. 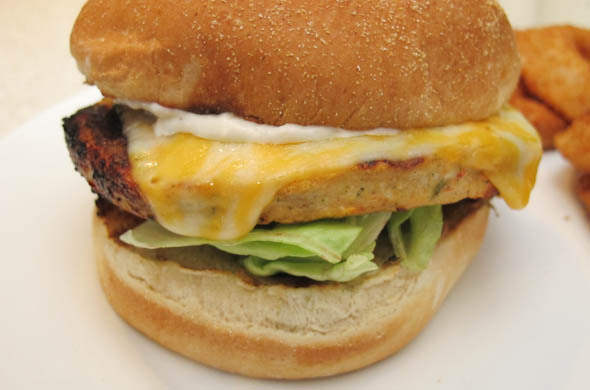 Premade turkey burgers aren’t the most amazing things ever so I definitely appreciated the added moisture to my burger. 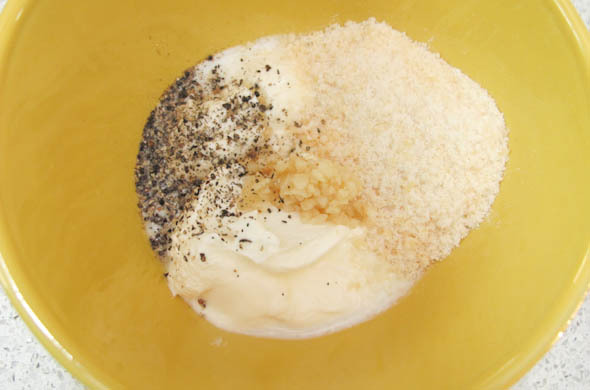 The pepper and salty Parmesan are such great flavors combined here. Then I used it for another meal – we’re in 100% grilling mode with Mr. J’s new grill. 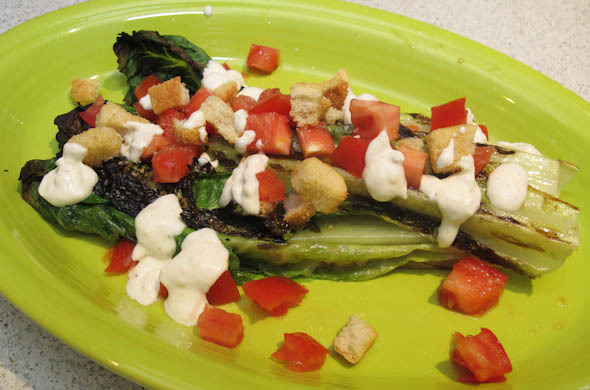 I had some heads of romaine leftover from some caesar salads so I figured we should do a grilled romaine and see what all the fuss was about. I love the charred bits on everything (lasagna corners, chicken wings, etc) so I really enjoyed this. I think we’d grill it a few seconds less next time. It needs the char, but I don’t want the ribs of the lettuce to get as soggy. I diced some tomato and used some broken croutons with some drizzles of Parmesan Peppercorn dressing. Yum. I added a touch of milk to thin it out a bit. That made it more like dressing. When it is thicker, it would be a great dip too! I was so excited about this meal! Maybe because it ended up all coming together so easily, but also because it was exactly what I wanted. 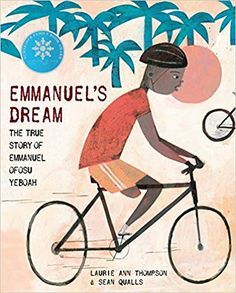 I wasn’t going to blog it, but then sometimes I skip blogging one and it is really worthy of sharing. Deleting unused photos is easier than wishing I had snapped some pics. This is precisely the food I want to eat. 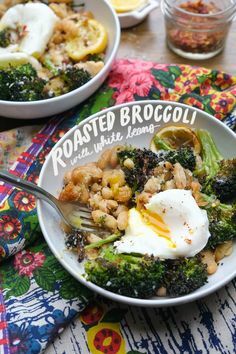 The sides complimented the protein nicely and they weren’t just filler…they were flavorful and nice additions to the meal. Mr. J got a new grill after MUCH deliberation. Now we are grilling machines and I feel like I need to up my side-dish game! The spice rub is adapted from the Essentials of Grilling by Williams Sonoma. Do not swap the chicken thighs for breasts. Trust me. Chicken thighs are how chicken is supposed to taste. They’re juicy and flavorful and ohh-so-good. Mix the dried herbs with salt and pepper. 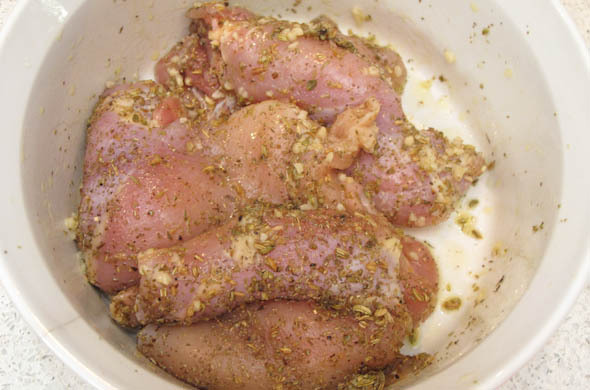 Pour the garlic and oil onto the chicken and then coat in the herbs. Set aside while the grill heats up. In a medium pot over medium-low heat, cook the onion and butter until translucent and soft. 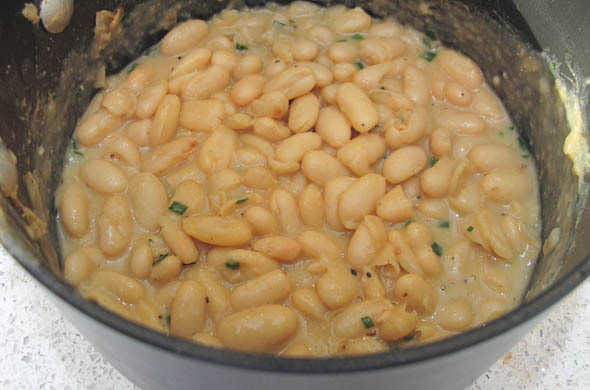 Drain and rinse the white beans before adding them to the onions. Add in the broth and cook for about 5 minutes at a low simmer. Cook the chicken on the grill, flipping and ensuring it cooks through. Reduce the temperature of the beans to low and add in the chives. Cook for another 5 minutes then turn off the heat but cover until serving. When the chicken is mostly cooked, squeeze half the lemon over it and grill the other half of the lemon. Serve the chicken with the grilled lemon. Enjoy! I loooved this. This is what I like to eat. The herbs were distinct and flavorful but not too much. I never use fennel but love the flavor and then that lemon. It really brightened everything up and was a nice contrast. I liked the smokiness it got and how juicy it got on the grill! 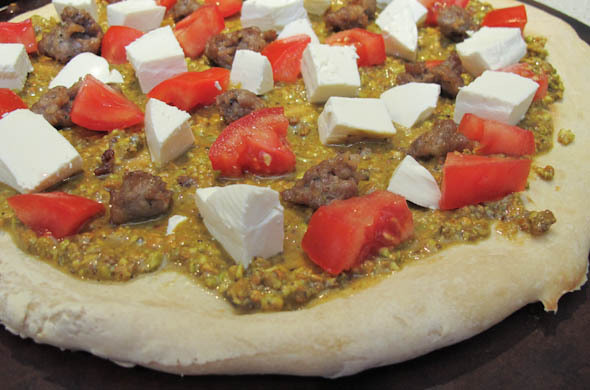 I saw this pizza topped with a pistachio spread and sausage from Don Antonio’s of NYC on Diners, Drive-Ins & Dives and was instantly excited by the pistachios on there. Apparently I wasn’t the only one either. I only tweaked it a bit and thought it was great for a change of pace. The pistachios up the price of making this pie for sure, but if you compare to a trip to NYC to have the real thing it is a bit more justifiable…also more convenient on a Thursday night. Preheat the oven and pizza stone, if using one to 400-degrees. 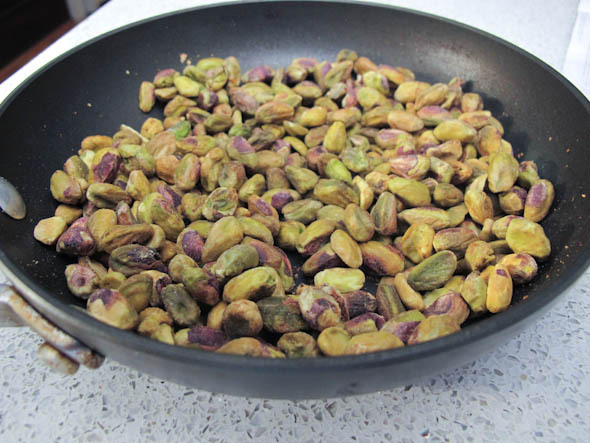 In a dry skillet, toast the pistachios over medium-low heat for about 5 minutes. Stir regularly. Spread the dough out to a very large, flat circle. Then put onto the hot pizza stone so it stops from shrinking back down in size and poke a few holes into the crust with a fork or knife. Then bake for 5-10 minutes – just until lightly cooking and beginning to brown. In a large skillet, fry the sausage over medium heat with the casing removed. Break into chunks with the back of a wooden spoon. In a food processor, add the toasted nuts, salt, pepper, and half the oil. 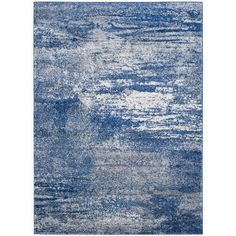 Pulse and stream in the rest of the oil. Taste & adjust as necessary. 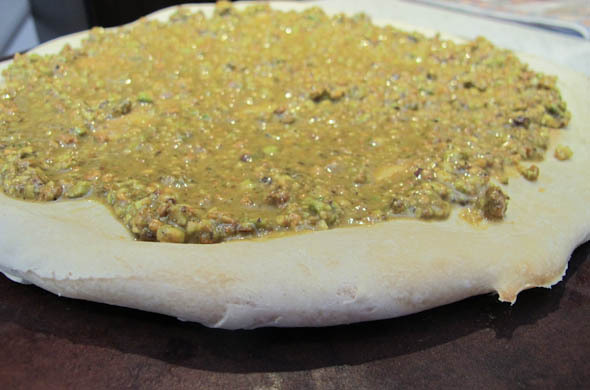 Spread the pistachio sauce onto the pizza dough. 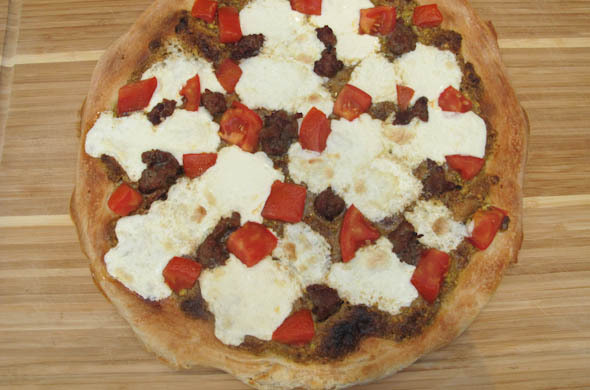 Then top with sausage, tomato, and mozzarella. Bake for 5 minutes, then broil for another 3 minutes or so. Watch it under the broiler! Let it sit a few minutes before slicing…otherwise you’ll lose the cheese. I liked the bubbly cheese with the pistachio crunch and the salty sausage. I probably should have added a fresh herb either into the pistachio sauce or onto the top. That was my goal with the tomatoes, but it could use a bit more of that. I went heavy on the pistachio sauce since I figured if I bought this whole bag of shelled pistachios, I was better off using them instead of saving some and then forgetting about them hiding away in the cabinet. Less of that would have been fine, or some dollops instead of spread all over would be good. The little one was snoozing so I contemplated toasting the nuts and just chopping them up as a topping instead of as a sauce but I stuck with the original plan and the food processor didn’t wake him up. I’ve been using a half of a ball of pizza dough to make pizza now. It makes for a much thinner crust and cuts down on how much dough we’re eating. It is mostly a measure of preference for reallllly thin crust but the health benefit doesn’t hurt either. I haven’t shared a smoothie in a really long time…as in August 2014 is a long time. Tis the season though! 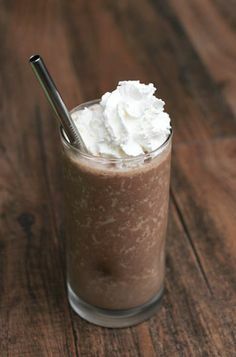 They’re such a great breakfast when it is warm out and aside from blending, it’s pretty one-handed convenient while doing a few things in the morning. My lemonade was pretty weak so that was my inspiration when I was seeking ideas to use it. My other use was a 5 o’clock option. 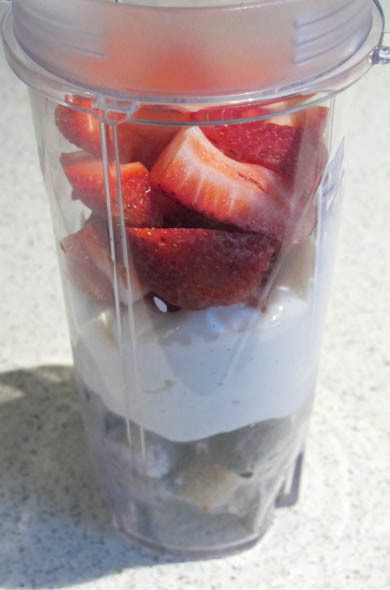 Add frozen pears, yogurt, and strawberries into the blender. Top it off with pink lemonade. 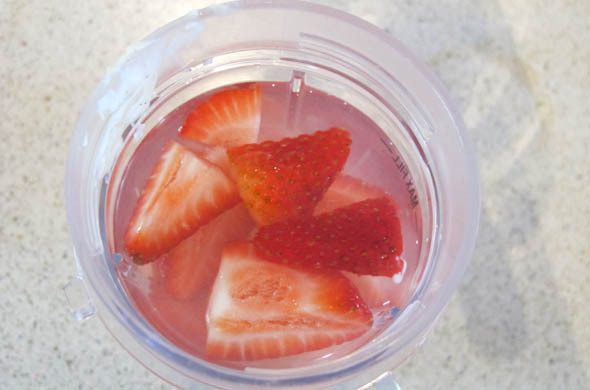 The strawberries could be fresh or frozen. 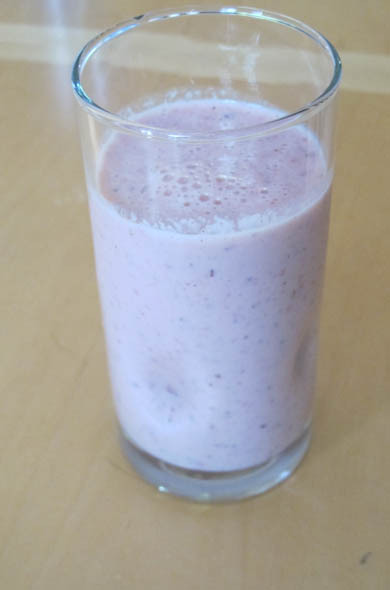 I like one fruit to be frozen so it is a cool and thick smoothie. I went with pears because I a) have a ton and b) thought they wouldn’t overpower the strawberries or the lemonade. The lemonade isn’t adding any nutritional value but I’m convinced that if your breakfast is fruit and yogurt everything else is just extra!